The history of the animated feature film does not begin, as most people tend to think and the Disney corporation tries to imply, with Snow White and the Seven Dwarfs in 1937. Rather, it begins 20 years earlier, with Argentine filmmaker Quirino Cristiani's satire El apóstol, a film lost after all known copies were destroyed in a 1926 fire. The second animated feature is...also lost, Cristiani's 1918 Sin dejar rastros [Without a Trace], a WWI film confiscated by the government and presumably destroyed. Which is why the modern animation scholar has to start with the world's third animated feature film, Lotte Reiniger's 65-minute fantasy The Adventures of Prince Achmed. It is customary to observe about this film that it's like nothing else ever made, and this is a flat-out lie: Reiniger herself made dozens of other films in the same style, and plenty of experimental animators, whether by direct influence or congruent evolution, have made films using the same basic technique. However, there's little doubt that most people, whether they first thing they think of when they hear the word "animation" is Fantasia or Shrek, Akiraor Gerald McBoing-Boing, The Lion King or Lines: Vertical, probably haven't ever really considered that animation could stretch as far as Reiniger's technique. 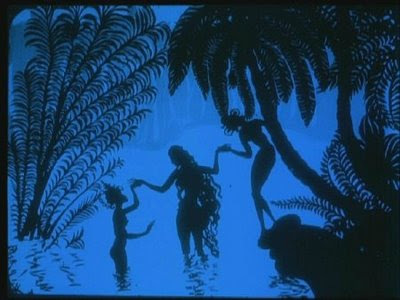 Reiniger's animation was achieved by cutting silhouettes out of black cardboard, stitching their joints together with thread, and placing them atop a lit screen. It's the exact same technique used in traditional shadow puppet theatre, which the director had been fascinated by from childhood. 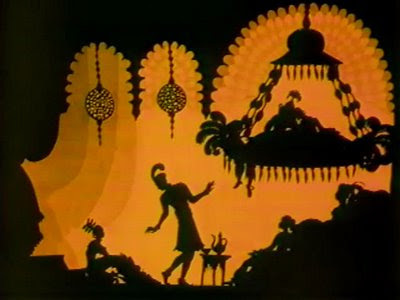 Only in Prince Achmed, which was animated using stop-motion techniques, there are no rods or wires to give away the illusion. Only black shapes moving against empty space, or sometimes against translucent backgrounds. Just as impressive as the detail is how much actorly expression Reiniger was able to achieve with virtually nothing other than extremely detailed hand movements, which she considered to be the most important element of her character design. Prince Achmed is not a model for deep psychological introspection, of course, but these are literal cardboard characters - that we are usually able to tell what they are feeling is a triumph that the word "triumph" seems singularly inadequate to praise. The film's plot is a pastiche of elements from One Thousand and One Nights: an evil African magician creates a wonderful flying horse to give the Caliph in exchange for a precious treasure; when that treasure ends up being the Caliph's daughter, Dirazade, the magician is imprisoned, but not until after he tricks the Caliph's son Achmed onto the horse, which takes the prince to a faraway place, the Spirit Islands. There he spies on the ruler, Princess Peri Banu, and falls in love with her, kidnapping her and running from her servant demons until he reaches China. There, the magician, escaped from prison, captures Peri Banu and throws Achmed into a wasteland where he meets the Witch of the Fire Mountain, the magician's greatest enemy; together with Aladdin, whose wonderful lamp was stolen by the same magician as he was seducing Achmed's sister, they fight the magician to rescue Peri Banu and Dirazade. Honestly, isn't that more what you'd expect from the first animated feature of all time, rather than a political satire that got the director in trouble with the Argentine government? Of course it's most just an accident of history that Walt Disney loved fairy tales and created the "animation = fantasy" stranglehold that persists to this day and makes movies like Persepolis seem so radical. But still, Prince Achmed is a fantasy that would have fit neatly into the Disney Studios ethos (very neatly indeed), a fantasy in which the narrative is neither surprising nor challenging in the smallest degree (living in the 21st Century, I can't help but be disappointed that a woman filmmaker would tell a story with such retrograde gender politics, even though it would be psychotic to expect otherwise). And just like Uncle Walt proved time and time again, nothing is wrong with a comforting story if you have the visual flair to dress it up. More than eighty years later, the most surprising thing about Prince Achmed is still how extraordinarily beautiful it is, just like people were saying back in 1926 (Jean Renoir, no stranger to beautiful movies, was an early admirer of the film, and instrumental in facilitating its general European release). Perhaps it is not a profoundly imaginative work: coming two years after Douglas Fairbanks's Thief of Bagdad was released, it doesn't depict anything that couldn't have been depicted in live-action, and none of the "camera set-ups" (I don't know what else to call them) stand out as being especially different from what one might have seen in any old Hollywood melodrama,except for a few strikingly geometric compositions that remind us that it was Germany, and there was an Expressionism going on. But that doesn't mean that the particular choice of silhouette animation wasn't inspired, or that Prince Achmed isn't a treat for the eye. It still looks like nothing you've ever seen, even if you in point of fact have. That one woman with three ill-defined "collaborators" could achieve something this stunning is frankly inspiring. Neither you nor I would like it all that much I spent much time describing in words things that are so gorgeous to look at, but let me just toss out one example: the scene in which Achmed spies on Peri Banu and her handmaids in a pool. The thing I want to point out is not the delicate position of the characters' arms, nor that I've now shown three frames that have three different tint colors - tinting is used extremely well in this film, apres the film's massive 1999 restoration - nor the fine detail in which Reiniger cut out all those little fronds. I want to point out the tiny pieces of paper used to represent reflections in the surface of the water, which as you cannot see in a still image, are "drifting" slightly. 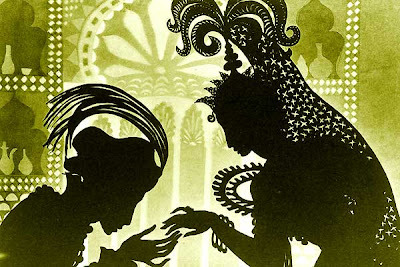 It's a tiny detail that, once you've seen it, is positively essential to creating the illusion that you are looking at a real thing and not just black shapes on blue light; that attention to tiny throwaway details is present throughout Prince Achmed, and it signifies the great love Reiniger put into the production. And that love, in turn, is the reason why Prince Achmed, after lifetimes of experiment, refinement and revolution in the artform, is still one of the most captivating animated films I've ever seen.